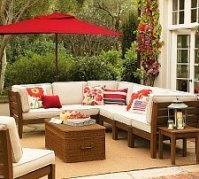 Patio Furniture Cushions - What Should You Look For? Patio furniture cushions are available almost everywhere. 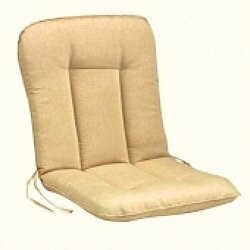 There are seat cushions, chair cushions (seat and back together), sofa cushions, bar stool cushions, bench cushions, rocking chair cushions, lounge chair cushions, glider cushions, and more. 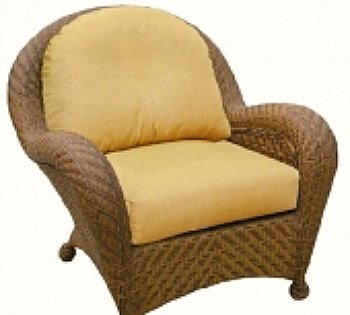 There are specialty outdoor furniture cushions including teak furniture cushions, cedar furniture cushions, wrought iron furniture cushions, wicker furniture cushions and Adirondack chair cushions. While teak and wrought iron are beautiful in their own right, they are not very comfortable until you add a nice soft cushion. 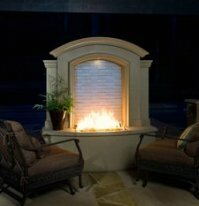 Patio furniture cushions are sold in department stores, discount stores, and hardware stores. You can order them online, or you can have them custom made. You can have them custom made online. No matter where you buy them, there are a number of things to consider first. I'll leave the color and style part up to you, but those aren't the only decisions you need to be making. 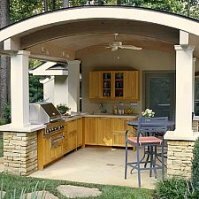 Before you find the perfect match for your patio umbrella or your porch swing, think about these other considerations. 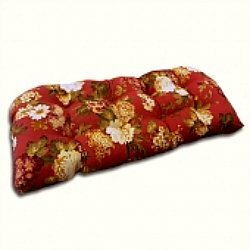 When looking for patio furniture cushions, obviously you should look for fabrics designed for outdoor use. That seems obvious, but if the cushion is made for a sunroom, it won't hold up in the great outdoors. So check it just to be sure. The fabrics should be resistant to stains and liquids. It should also be fade, rot and mildew resistant. Check to see whether you will need to treat the cushions with protectants. Now let's look at some specific fabrics. These fabrics are very similar, but acrylic linen is exclusively for outdoor use and is softer with a looser weave. Acrylic is soft, too, just not quite as soft. These fabrics retain their color well and are stain and soil resistant. The fibers are colored all the way through, hence the color fastness. They clean easily with soap and water. They resist rot as well as mildew, and as noted, are comfortable with a soft, canvas-like feel. Mildew will not grow on the fabric itself, but may grow on dirt which accumulates on the fabric surface. For all of these fabrics, that is the primary reason its important to keep them clean. Acrylics are probably your best long term value. Sunbrella is a well known acrylic fabric. The fabric is water repellent, not water proof. It is recommended that the fabric be treated with a water repellent treatment after cleaning, particularly if they are constantly exposed to outdoor conditions. Barkcloth gets its name from its rough, bumpy texture (like tree bark), although it is a soft but thick fabric. This fabric is not as resistant to mildew and as such must be washed and rinsed often to resist mildew and keep it looking new. Be careful with oils and suntan lotions with barkcloth - it doesn't resist them well. This fabric is a blend of both spun and filament fibers which is designed for exclusive outdoor use. The resulting fabric is soft, silky and thin. Filament fiber resists stains, fading, and mildew, but like barkcloth, it must be washed often to maintain its new appearance. Olefin is another fabric designed exclusively for outdoor use on patio furniture cushions. It retains its color and vibrancy very well for years. The open weave design keep this fabric cool as well. It is durable and resists fading, stains, mildew and abrasions. Like some of the other fabrics, it should be cleaned periodically to maintain its resistance to mildew and to keep it looking new. Contact with suntan lotions and oils should be avoided, and cleaned immediately if found. Olefin is a soft, canvas-like fabric. PVC fabric is made by taking a polyester core and coating it with colored PVC and weaving it into a fabric. The resulting product is extremely durable and resistant to mildew, stains, soil, fading and abrasion. It is also stays cool in the sun. It cleans easily and once again, direct contact with suntan lotions and oils should be avoided and cleaned off immediately. They tend to accelerate deterioration of this fabric. PVC is a stiff fabric with a plastic feel. This fabric is made completely of polyester but has the feel of soft cloth. It stays cool in the sun and is pre-treated for resistance to stains and soil. It is designed exclusively for outdoor use and is easy to care for. Occasional cleaning will prolong the life of your spun polyester cushions. This fabric is a combination of filament and spun polyester and naturally has a combination of their characteristics. The result is a soft canvas-like fabric sometimes with a silky feeling. It is exclusively for outdoor use and as with most fabrics, direct contact with suntan lotions and oils should be avoided or cleaned promptly. Periodic washing with soap and water will help maintain a new appearance. Woven fabrics are another option for your patio furniture cushions. They have a soft, comfortable surface and can feel a little bumpy and occasionally rough. These fibers are pre-dyed and patterns are achieved by weaving the pattern into the fabric. The result is a colorfast fabric that holds its color well. This fabric stays cool and is resistant to soil, stains, and mildew. Keep the suntan lotions and oils away, or clean them off immediately. Foam or "poly fiber filling" is a common material used for cushion filling. It offers comfort, but if it gets wet - drying time is long. This filling is more appropriate if you desire firmness. For a softer, fluffier feel, loose fibers are best. They also dry faster. The overall look of your patio furniture cushions can be altered with stitching patterns or with the addition of buttons. These items are aesthetic and are a matter of taste (or lack of same). Piping or cording on the edges has aesthetic appeal, but also serves to reinforce and protect the seams. Some cushions come with tie straps at the corners. These can be quiet useful if you live in a windy area. There are tassels, fringe, and braids that can add appeal or can win you first place in the tacky parade, depending on how they are used. Your options are almost limitless when it comes to patio furniture cushions. Available in nearly any color, style, and choice of fabrics, you are sure to find just the right touch to make your outdoor living area more comfortable as well as more attractive.